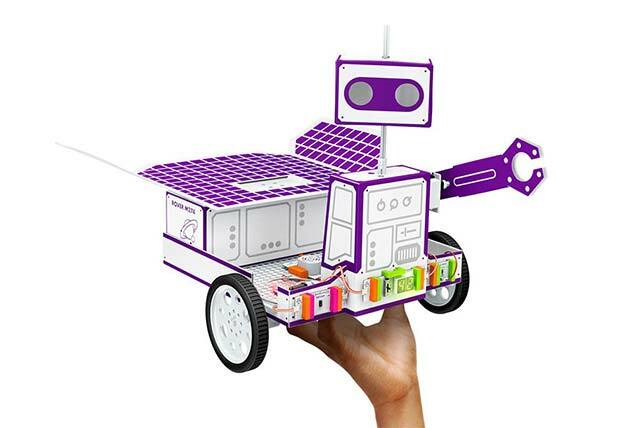 littleBits, the company that introduced sets of electronic building blocks for use in classrooms to help students learn how technology works, has launched three new STEAM kits for ages 8-plus to inspire them to invent. Each includes step-by-step guides to help the students assemble their devices. The parts in the kits are interchangeable and can be used to create new inventions. The Base Inventor Kit (about $100) guides the young users through 12 activities that involve building inventions, including an intruder alarm and a voice-activated robotic gripper arm that can act as a prosthetic. Components include a buzzer, a latch, a long LED, a power unit, a proximity sensor, a servo, a slide dimmer, a sound trigger, wire, a battery and cable, a mechanical arm, two mounting boards and paper templates. The Electronic Music Inventor Kit (also about $100) helps the students build and customize a synthesized guitar that can be transformed into other electronic instruments, such as hands-free air drums. This kit comes with an accelerometer, keyboard, micro sequences, oscillator, a power unit, a proximity sensor, a speaker, wire, a battery and cable, two mounting boards, paper templates, a sticker sheet and various plastic components. The Space Rover Inventor Kit (about $200) supports the kids in creating a planetary rover that can emulate NASA missions, such as collecting rocks and detecting life forms. The kit includes a bargraph, buzzer, control hub, two motors, a light sensor, a long LED, a number display, a power unit, a proximity sensor, a servo, wire, a battery and cable, an axle, a ball caster, a mechanical arm, mounting boards, a motormate, paper templates, a sticker sheet and other electronic pieces. The company also has provided additional online video content and tutorials tied to the kits on JAM.com, a fee-based video course platform for young people. JAM is produced by DIY, which littleBits acquired this year. According to the company, the extra content will include "tips, stories and demonstrations for young inventors." "littleBits is an activist company: we want to empower kids to invent the world they want to live in," said Ayah Bdeir founder and CEO, in a statement. "We are inspired by this generation's desire to help others, improve their communities, or break new barriers in music making and space science. Our newest line of products is designed to equip kids with what they need to understand how technology around them works, get excited about STEM/STEAM, and use invention methods to make their creative ideas happen."